The recent spat – if one may call it that – between two former commanders of the Sri Lankan army has caused quite a furore. Field Marshall Sarath Fonseka and Lieutenant-General Jagath Jayasuriya have engaged in a heated exchange over issues of both command and control responsibity as well as alleged war crimes. Sarath Fonseka served as Army commander from Dec 6th 2005 to July 15th 2009. His immediate successor Jagath Jayasuriya served as army commander from July 15th 2009 to July 31st 2013. The clash between Fonseka and Jayasuriya may very well be described as a battle between two ex – army commanders. The flare- up occurred when Lt.Gen Jagath Jayasuriya who was accredited to Brazil and five other South American countries as Ambassador got targeted by a human rights organization which sought to invoke universal jurisdiction against the ex -army chief turned envoy for war crimes allegedly committed during the war between the Sri Lankan armed forces and the Liberation Tigers of Tamil Eelam(LTTE). Jayasuriya who had returned to Sri Lanka by that time denied all such allegations. It is indeed noteworthy that the official position of the Sri Lankan Govt during the war was that the armed forces were implementing a “zero civilian casualty policy”. The inevitable conclusion arising from such a stance would be that no civilians were harmed. The then president Mahinda Rajapaksa went on record that the Sri Lankan soldiers fought the war with ” a weapon in one hand and the UN Human Rights charter in the other hand, carrying provisions on their backs for the entrapped civilians with their hearts brimming over with compassion”.This statement by the then supreme commander of the armed forces suggested by extension that no war crimes were committed as alleged. It was against such a backdrop that the Non -governmental organization International Truth and Justice Project (ITJP) resorted to legal action against Jagath Jayasuriya in Latin America. It is somewhat a puzzle as to why the ITJP waited until the tail -end of the Sri Lankan envoy’s tenure to file suits in courts instead of doing so well before his term ended. The ITJP had raised such allegations before when it publicised reports of alleged human rights violations and war crimes being committed at the Sri Lankan Army’s “Joseph Camp” in Vavuniya. Jagath Jayasuriya who served as the Wanni region commander in the final stages of the war was based in the camp referred to as “Joseph camp”. Although people in northern Sri Lanka as well as international organizations referred to the main security forces camp in Vavuniya as “Joseph” camp, in reality the camp’s name was not Joseph. It was actually “Jossop”. When JR Jayewardene was the Sri Lankan president and minister of defence , the Joint Services Special Operations Command (JOSSOP) was set up in Vavuniya to co-ordinate “anti-terrorist activity” in the districts of Mannar, Vavuniya, Mullaitheevu and Trincomalee. The Vavuniya camp housing the JOSSOP headquarters was referred to as the “Jossop camp”. Gradually the people started calling the camp by the name “Joseph” instead of Jossop as it sounded alike. Some years later the JOSSOP was dismantled but “Joseph camp” remained as the head camp of the Wanni based security forces. When the ITJP resorted to legal action and raised allegations against him, Jagath Jayasuriya denied all complicity. There was a spate of media interviews in which the retired Lt.General refuted all charges made against him. A point he emphasised in his favour was the fact that he had not been involved in actual combat during the final phases of the war. As such he could not be accused of alleged war crimes as he had no role to play in the fighting was the ex-army chief’s stance. Jagath Jayasuriya had been appointed Wanni security forces commander on August 7th 2007 and had continued in that position till the war ended in May 2009. Thereafter he continued in that position until succeeding Sarath Fonseka as army commander on July 15th 2009. It was at this juncture that former army commander and current Regional Development minister Sarath Fonseka queered the pitch for his erstwhile successor. Fonseka conducted a press conference in which he accused Jagath Jayasuriya of having committed war crimes. The Field Marshall claimed that he had proof and would be ready to testify against Jayasuriya if an investigation was held. It is widely acknowledged that there was little love lost between Fonseka and Jayasuriya. However Fonseka’s unexpected intervention was not entirely due to personal animosity. There was an element of self -preservation also. Jagath Jayasuriya claiming that he had no part in the actual fighting and could not be held responsible for whatever had allegedly occurred in the battle front was an indirect attack on Fonseka himself. The implication was that it was Fonseka as the Army commander in overall charge who had to bear responsibility. If Jayasuriya was allowed to continue in this manner without being challenged, it would only have been a matter of time before blame would have been attached to Fonseka. Anticipating such an eventuality perhaps the Field Marshall staged the press conference in what could be likened to a pre-emptive strike to deflect the issue. The statements made by Fonseka amounted to a bombshell. It was seized upon by and utilised by different sections for different reasons. Jagath Jayasuriya was compelled to respond to Fonseka. He reiterated the fact that he was only in charge of logistics and had never been the fighting commander. He further said that if indeed war crimes had occurred they were likely to have happened in the frontlines. As such the then army commander Fonseka bore responsibility and not he , asserted Jayasuriya. A point in the Lt.General’s favour was the statements made by the Field Marshall himself. According to newspaper reports Field Marshall Fonseka at his media briefing had clearly stated that Jayasuriya, in his capacity as SF Commander, Vavuniya, hadn’t enjoyed command and control responsibilities over fighting formations, deployed in the Wanni west and Wanni east fronts. Fonseka said Jayasuriya had been tasked with ensuring supplies and basically looking after the area under government control. His functions had been similar to those assigned to the then SF Commander of Jaffna Maj. Gen. G.A. Chandrasiri. Though Fonseka himself had in a sense “absolved” Jayasuriya of responsibility for whatever acts of omision or commission on the battle field, the Field marshall was not ready to let Jayasuriya “slip” way easily. Speaking to the media subsequently the regional development minister said that he had information about some atrocious incidents happening to those detained at the Vavuniya headquarters camp. Therefore Jayasuriya had to take responsibility opined Fonseka. This statement had serious ramifications for Jayasuriya as the ITJP had on several occasions alleged that several human rights violations including torture had been committed at the Vavuniya “Joseph” camp when Jagath Jayasuriya was in charge there as Wanni Security forces commander. Ironically the same Jayasuriya who was disclaiming any responsibility in conducting the war in its final phase spoke differently in the aftermath of the war in 2009. Media organs run by sections of the Tamil Diaspora were quick to point out these ironic contradictions. “The entire northern operation was conducted in the tactical area of responsibility that came under my command,” Jayasuriya had said in 2010 in his capacity as Army commander. . “I was actively involved in the ground operations executing directives from Army headquarters and the Ministry of Defence.” Testifying before the Lessons Learnt and Reconciliation Commission in 2010 Jayasuriya had said “Overall I was responsible for the conduct of the whole thing”. Now Lt. Gen Jagath Jayasuriya was on the defensive saying he had no command responsibility during the war’s final phase. Moreover the concepts of command and control were being made a mockery of by both antagonists. The on going internecine crossfire between the Field Marshall and Lieutenant -General provided much entertainment to the casual observer. Sadly the verbal clash portrayed the armed forces in very poor light. The patriotic public of Sri Lanka which regards the Army as “War Heroes” was aghast and dismayed. The two ex-army commanders were like school chidren blaming each other when being pulled up by the teacher for committing mischief. 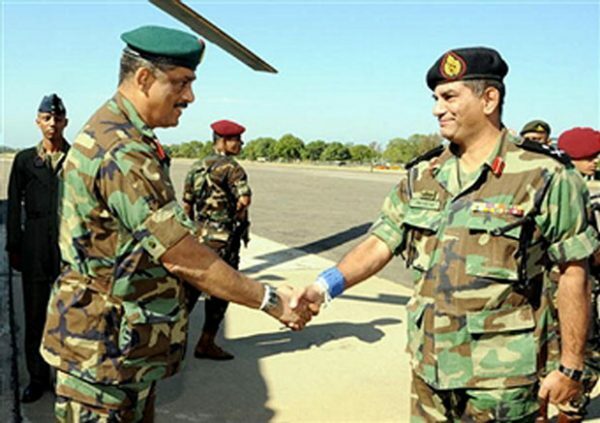 The public spat between Fonseka and Jayasuriya may have continued further but for the intervention by present Army commander Lt.Gen Mahesh Senanayake. The army chief went public saying that personal rivalries should not be allowed to sully the Sri Lankan army’s reputation. He said that even if a single officer was criticised openly it affected the entire army’s morale. Senanayake who had been victimised by the Rajapaksa regime in the belief that he was a confidante of Sarath Fonseka expressed displeasure over Fonseka’s outburst. The army chief pointed out that he had never criticised the army though he (Senanayake) had been given a raw deal. He also clarified that only an allegation had been made in a foreign country against Jagath Jayasuriya and nothing else. The highly respected Army commander’s response was widely welcomed. Senanayake’s public comments along with private efforts at peace making by senior political leaders paid dividends. There was an undeclared cesefire between the Field Marshall and the Lt.General. The vocal artillery of the ex-top brass fell silent. Meanwhile President Maithripala Sirisena declared openly that he would not allow anyone ” to touch Jagath Jayasuriya or an Army officer or any war hero”. With the Government’s position on the allegations against Jayasuriya being made clear an uneasy peace has descended upon the two warring ex- army chiefs. This clash of the two ex -army commanders cannot be viewed in isolation as a single, stand alone incident. There is a history of deep seated animosity behind the verbal duel that cannot be overlooked. The personality clash between Fonseka and Jayasuriya is a consequence of the politicization process of the military that has been going on for more than half a century. This politicization of the military assumed immense proportions during the Rajapaksa regime. In a bid to win the war against the tigers the armed forces were politicized to a very great extent. The intensified war resulting in Victory over the LTTE brought about a host of unintended consequences in its wake. Chief among them was the birth and growth of the Fonseka phenomenon.This process underwent a drastic turn when the war winning army commander challenged the war winning president at the presidential stakes. This brought about a sea change in the politico- military environment. The army top brass was divided politically. Officers who would have been apolitical “gentlemen” under normal circumstances turned into political animals. The Fonseka -Jayasuriya split was aggravated due to the Rajapaksas playing “politics”with both. It would be relevant at this point to briefly delve into the history of the war winning army commanders’s conflict with the Rajapaksas after the war was over and how this exacerbated the divide between Sarath Fonseka and Jagath Jayasuriya. Mahinda Rajapaksa was elected Executive President on November 18, 2005. 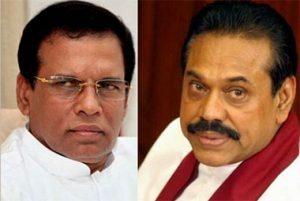 Despite being elected through an enforced boycott by the Tigers it soon became apparent that Medamulana and Valvettithurai were on a collision course.Mahinda Rajapaksa made two crucial appointments at the onset of his presidency in anticipation of a savage war with the LTTE. One was to make his younger sibling Gotabaya Rajapaksa Defence Secretary. The other was to appoint Sarath Fonseka as Army Commander and extend his tenure. It was at Gotabaya’s behest that Sarath Fonseka was made army chief. He was scheduled to retire as he would have reached the mandatory age 55 on December 6, 2005. But Gotabaya persuaded his brother to make Sarath army chief because Fonseka was the best man to lead the army at that point of time.The serving Commander Maj. Gen. Shantha Kottegoda was sent to Brazil as ambassador and Fonseka brought in. Thereafter his term was extended each year on December 6th his birthday. In May 2009 the Liberation Tigers of Tamil Eelam (LTTE) organization met its waterloo by the waters of Nandhikkadal lagoon, the lion’s share of credit for the victory against the Tigers was apportioned to the triad at the helm.The triumvirate comprising President Mahinda Rajapaksa, Defence Secretary Gotabaya Rajapaksa and Army Chief Sarath Fonseka was hailed for providing political, administrative and military leadership respectively in the triumphant war against the Tigers. After the war ended the Rajapaksas of Ruhunu wanted to channel the war victory euphoria into electoral success for Mahinda at the presidential elections. They counted on Sarath Fonseka with his war victor image to engage in propaganda for the Machiavelli of Medamulana. Foseka however had other ideas and thought of cashing in on his martial image for his own benefit instead of propping up the Medamulana oligarchy as expected.Unfortunately for the Rajapaksas their “creature” like that of the monster created by Dr. Frankenstein had a mind of its own and refused to play second fiddle. “Why Cant I be the Next President? On spirited occasions Sarath Fonseka has the tendency to fire off like a loose cannon. Fonseka began talking of himself as the man who defeated the Tamils like the Rohana and began querying from friends and acquaintances in bantering tones “Why can’t I be the next president?”As far as Sarath was concerned it was he and not Mahinda who won the war and saved the country.As news of this changed attitude was conveyed to the Rajapaksa brothers the alarm bells started ringing. A real or imaginary threat to the Mahinda’s political fortunes was perceived. There continued various irritants between the Rajapaksas and Fonseka. Some of the noteworthy ones included the one where former first Lady Shiranthi Rajapaksa and elder son Namal were stopped by the army on a journey to the north and were delayed unduly for hours. This was seen as being done at the behest of Fonseka himself. On July 9 2009 Fonseka spoke at a book launch about the war in which he heaped compliments upon himself lavishly. Token lip service was paid to the President’s role. Gotabaya was virtually ignored. According to Sarath he and he alone had won the war with the President’s support. It was a one-man show. This implied that Sarath and not Mahinda was the saviour of the nation. Another incident was the felicitation ceremony at Dharmasoka College, Ambalangoda on July 10 2009. All traffic was stopped along the Galle Road for hours. There were massive security arrangements made arbitrarily by Sarath’s security personnel causing much hardship to people.Sarath waxed eloquent about his role in winning the war alone to an appreciative home audience.There were increasing signs that Sarath and his merrymen in the army were becoming a law unto themselves. It was as if a parallel authority was being exercised by Fonseka in certain spheres. Sarath Fonseka had strong likes and dislikes. He despised some of his officers and discriminated against them unfairly while favouring others whom he liked. One of the senior officers who fell foul of him was Jagath Jayasuriya. Fonseka called him weak and inefficient and refused to let him go up to the frontlines. Jayasuriya the Wanni region commander was kept in charge of administration and logistics but not allowed any battlefront duties. Jayasuriya however was a distant relative of the Rajapaksas and had access to both Mahinda and Gota. This irritated Fonseka further. In what was a very high-handed incident military officials acting under the orders of Fonseka arrested the aide de camp of Jagath Jayasuriya for questioning. The aide de camp was interrogated about the personal relationship he had with Jagath Jayasuriya. He was specifically asked about the time he allegedly spent in the company of Jayasuriya in the Wanni commander’s chalet. The line of questioning aimed at establishing that a homosexual relationship existed between both. At one stage there was even a plan to arrest Jayasuriya also but when the Rajapaksas became aware of it the move was thwarted. It was against this backdrop that the Mahinda government made its move. Suddenly Fonseka’s world went crashing down. He was urgently summoned on July 12th 2009 and given three days to bow out as Army Chief and take over as Chief of Defence Staff (CDS).Reluctantly Fonseka submitted to the ultimatum and relinquished his army chief post and became CDS. His request that his close associate and Jaffna commander Gen. Chandrasiri be made army chief was rejected. The Rajapaksas were in no mood to appoint someone close to Fonseka. Instead Jagath Jayasuriya ranking 9th in seniority was appointed army chief over the heads of eight others. 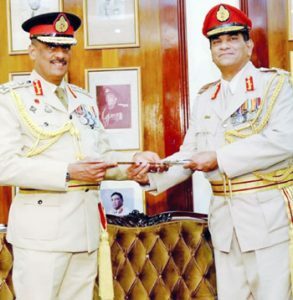 Given Fonseka’s rebellious attitude the Rajapaksas wanted a trustworthy loyalist as Army commander. Jayasuriya fitted the bill perfectly. As Fonseka “retired” on July 15th 2009 as Army commander , he was succeeded by Jagath Jayasuriya as army chief on the same day. From Fonseka’s perspective this was adding insult to injury. Though Fonseka remained as CDS , he found himself being undermined systematically within the army by the new commander. Exhibits pertaining to Fonseka were removed at the army exhibition. His address at the Army 60th anniversary function was blacked out in the state and significant sections of the non-state media. After Fonseka was kicked upstairs as Chief of defence staff (CDS) Jagath Jayasuriya the new Army commander made a number of internal appointments, transfers and alterations within the military structure. Many of the Fonseka loyalists in sensitive posts were moved out to non-strategic positions. Strategically important positions were filled by persons hostile to Fonseka.The Fonseka effect was being steadily reversed. Even his staff at CDS was infiltrated by elements hostile to him. There was also much talk that Fonseka and those regarded as his loyalists were being monitored discreetly. A thoroughly infuriated Sarath Fonseka then submitted his resignation coming into effect from December 1st 2009 to former Presidential Secretary Lalith Weeratunga at 1.30 pm on Thursday, November 12.The three-page letter outlining 17 reasons for quitting was promptly accepted as Mahinda Rajapaksa had given clear instructions that the resignation should be accepted if and when Fonseka submitted it. In that Letter Fonseka made a specific complaint against Jagath Jayasuriya. “The present Army Commander immediately on assuming duties commenced transferring senior officers who immensely contributed to the war effort during my command tenure including those junior officers working with my wife at the Seva Vanitha Army Branch which was involved in looking after the welfare of the troops, was clearly to challenge the loyalty of officers and most discouraging to the officer corps of the Army, with a wrong signal being transmitted on my authority”. After resigning as CDS Fonseka plunged into politics and became the common opposition presidential candidate. During the election campaign the ex-army chief was very outspoken. In that process he was very critical of the then government, former defence secretary and high-ranking officers from the defence services at that time. Fonseka also frequently played his favourite tune of claiming credit for the war victory. In a bid to counter this, the Mahinda government departed from military tradition and “arranged” for serving army officers to speak out against Sarath Fonseka both directly and indirectly. The Rajapaksa regime also ensured that maximum propaganda mileage was derived from those militaristic pronouncements. Enhanced media coverage was provided. Thus the country at large saw statements attributed to the serving Army Commander Lt. Gen. Jagath Jayasuriya being given wide publicity in the media. Some of these statements by Jayasuriya refuted Fonseka openly. Even internal meetings addressing military personnel within army premises by Jagath Jayasuriya found their way into the media courtesy of the Defence Ministry websites. The then Army Spokesman Brig. Udaya Nanayakkara often exceeded his designated mandate by commenting specifically on matters related to Sarath Fonseka. Apart from this many other high-ranking army officers began giving media interviews. Chief among them was Maj. Gen. Shavendra Silva. Since Sarath Fonseka had referred critically to Shavendra Silva in an interview given to “The Sunday Leader” the Major General had some reason for defending and clearing himself. Nevertheless the practice was not something desirable in the long run. Other army officers like Maj. Gen. Kamal Gunaratne, Maj. Gen. Chaggi Galage, Maj. Gen. Prasanna Silva, Maj-Gen Kapila Hendavitharana and Maj-Gen Prasad Samarasinghe also gave interviews to the state media. Most of these interviews ostensibly related to military matters and the war against the Tigers but there was no mistaking the patent political sub-text.They were all part of a political agenda aimed at undermining Sarath Fonseka and promoting Mahinda Rajapaksa. This type of brazen politicking by military officers was something unheard of in the not so distant past. All this happened under the watch of the newly appointed army commander Lt.Gen Jagath Jayasuriya. The conduct of former Defence Secretary Gotabaya Rajapaksa was extremely controversial during the election campaign. Despite the fact that he was a top government servant the then Defence Secretary engaged in open political discourse while addressing public meetings. He gave lots of media interviews with political overtones. The Defence Ministry website operating under Gota went to town regularly against Fonseka in favour of Mahinda Rajapaksa. It was in such a situation that the country went to the presidential poll on January 26th 2010. Mahinda Rajapaksa defeated Sarath Fonseka. Thereafter the Rajapaksa regime came down hard on Sarath Fonseka and his supporters. The crackdown commenced immediately after the Election results were announced. « Animals Suffer Harassment on Opening Night of Special Nocturnal Zone at Dehiwela Zoo.